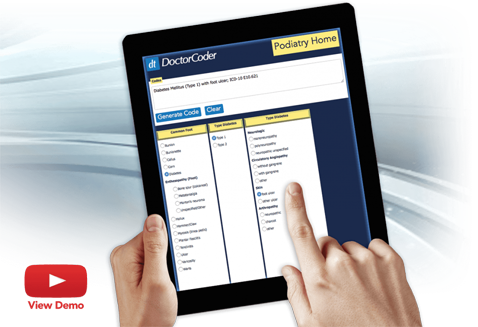 DT DoctorCoder is a medically-intuitive, subscription-based ICD-10 coding program designed exclusively for Podiatrists. This unique tool guides you quickly and easily through a series of relevant fields to determine the appropriate ICD-10 diagnosis codes, as required by CMS and private payors. As a DT DoctorCoder Subscriber, you will have unlimited access to this incredible tool, which, on average, can generate codes in as little as 15-30 seconds! » Try it for yourself!